Santa Cruz, the host of “all the damn vampires”, is now home to the evil, frightening James Christianson. 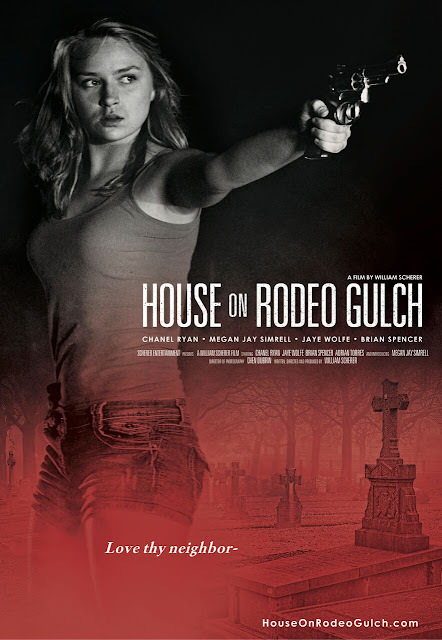 Chanel Ryan (Bad Kids Go to Hell) and Barry Ratcliffe (Ted 2) star in writer-director William Scherer’s Hitchcockian thriller HOUSE ON RODEO GULCH (which is inspired by real events) now available on VOD. HOUSE ON RODEO GULCH was created from a true story. While in my late twenties I bought a small three-unit apartment building that had one of the units vacant. I put in a nice new cream-colored carpet in the living room and rented it out to a young couple. A week later I visited them to find out the boyfriend had driven his Harley Davidson motorcycle into the living room and had taken the engine apart as oil, parts and dirt was all over my new carpet. Furious, I had no grounds to have them arrested, only give them a "thirty day notice to leave". After thirty days they still hadn't left and thus became "the tenants from hell". I thought afterwards, if only I had put something in the walls/ceilings that would have scared them into leaving on their own. I love strong women who find their strength through adversity. I also love Alfred Hitchcock and psychological thrillers that requires the audience to think. Throw in a bit of humor and you have- HOUSE ON RODEO GULCH. Great movie! Filmmaker did a fine job.